The first thing you should know is: there's no such thing as coincidence. There are beings that watch over you. Some of us were like you, once. Call us what you will, guardians, agents, sentinels or perhaps spirits, angels, demons. No matter how you think of us, we have one purpose. We are architects of chance, we make coincidences. 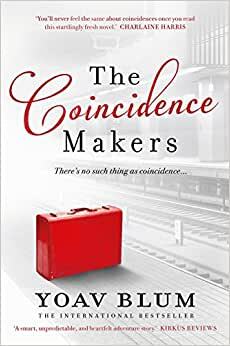 Start reading The Coincidence Makers on your Kindle in under a minute. Yoav Blum is an international bestselling author and software developer. His first three books became instant bestsellers in Israel. The Coincidence Makers, his debut, will be translated into twelve languages. He currently lives in Israel with his wife and daughter. When he is not writing (literature or code) he contemplates what he'll do when he grows up. Not a gripping read. Had potential but didn’t follow thru. This is a novel that was very different from what I expected. It would have helped if I had known that it wasn’t really a novel. This book is more about vignettes of characters and eventually how their paths cross. There is a lot about Guy, a coincidence maker, but also a lot of flashbacks to his past. This is not a traditional novel that follows a character and a plot progresses. I loved the concept but I was annoyed by it in the middle when I did not understand why there wasn’t more of a plot. Even with that annoyance I was very moved as it wound its way to the end. I wish it had been longer. There was so much to the world the author created that I would have liked to learn more, especially about Eric. Imagine a coincidence maker working behind the scenes to orchestrate the events of your life - to make sure you land that special job, meet that special person, etc. It was interesting to read how that could happen. I found it a little slow getting started, but then it just got more and more and MORE interesting. What a creative concept! Loved it. 1.0 out of 5 starsThe concept of this book had so much potential but I was 80% of the way through before it actually started reaching it. The writing was far too general , plot was too convoluted . Sense of setting, place and time was not well established until 90% of the way through. The concept of this book had so much potential but it took 80% into the book before it even got close. The writing was far too general and the plot ambiguous. The sense of setting, place and time were not well established until 90% of the way through. I read it to help fall asleep.Not worth the money. This story satisfies the yearning to see a full circle completed. It's a suspence, a romance and a delightful read.